I am a University Distinguished Professor at Swinburne University. 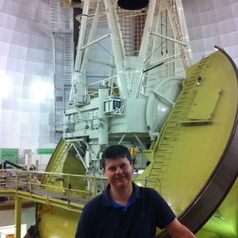 Originally from the UK I did my PhD at Edinburgh (1992) and did post-doctoral work in Durham and Cambridge before becoming a Staff Astronomer at the Anglo-Australian Observatory in Sydney. I became a Professor at Johns Hopkins University in Baltimore in 2000 and moved to Swinburne in 2006. My research is in areas of galaxy evolution over cosmic time, cosmology and astronomical instrumentation, I am an observational astronomer who uses large telescopes on the ground such as Keck, Gemini and the Hubble Space Telescope. In 2014 I became Director of Swinburne's Centre for Astrophysics & Supercomputing. I have served on the College of Experts for the Australian Research Council, and am currently on the Board of Directors for Astronomy Australia Ltd.